I believe in God, the Father Almighty, creator of heaven and earth and in Jesus Christ His only Son, Our Lord, who was conceived by the Holy Spirit, born of the Virgin Mary, suffered under Pontius Pilate, was crucified, died and was buried. He descended into Hell. The third day He arose again from the dead. He ascended into heaven, sittith at the right hand of God, the Father Almighty; from thence He shall come to judge the living and the dead. I believe in the Holy Spirit, the Holy Catholic Church, the communion of saints, the forgiveness of sins, the resurrection of the body, and life everlasting. Amen. Blessed be the Name of the Lord now and forever. Amen. 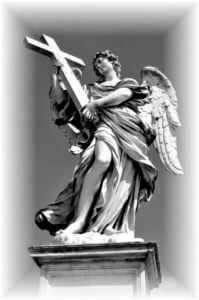 Glorious Archangel St. Raphael, great prince of the heavenly court, you are illustrious for your gifts of wisdom and grace. You are a guide of those who journey by land or sea or air, consoler of the afflicted, and refuge of sinners.I beg you, assist me in all my needs and in all the sufferings of this life, as once you helped the young Tobias on his travels. Because you are the “medicine of God” I humbly pray you to heal the many infirmities of my soul and the ills that afflict my body. I especially ask of you the favor (here mention your special intention), and the great grace of purity to prepare me to be the temple of the Holy Spirit. Amen. The St. Raphael Oil is a blessed sacramental like holy water it is not the Holy Oil used in the Catholic Church’s Sacraments. In using sacramentals, as lay people we should not confuse this oil with the Church’s holy oil that is conferred only by a priest in the Anointing of the Sick. It is for personal use and never sold. It should be noted that Jesus instituted the Sacraments; the Catholic Church instituted the sacramentals. Another difference is that the Sacraments are said to work by the direct power of Christ, while a sacramental obtains grace or power by the prayers of the Church. The purpose of all sacramentals is to help people grow in faith. In essence, they are contact points that represent Catholic faith. Blessed Oil should not be associated with superstitions such as the Blessed Oil having a magical power in itself. Blessed Oil is a symbol of God’s grace at work through the faith of the believer. 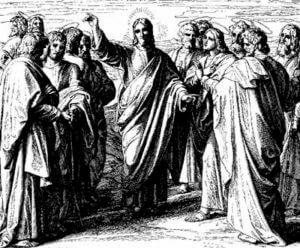 Such faith must be Jesus-centered, as was the faith of the blind man in John 9; he had faith in Jesus, not in the mud and spittle used by Jesus to heal him. Otherwise, the Blessed Oil can be used in similar fashion as Holy Water. You can bless yourself or another by proxy, you can place a cross of the oil, above your doorposts and windows, and in other ways similar to how we use Holy Water. It is used as a healing balm and/or a protection against evil. The usage of Blessed Oil by lay people is an ancient custom of the Catholic Church. It can be used when praying for the sick as long as a clear distinction is being made between the Sacrament of the Sick and sacramental use of the blessed oil. In this particular usage, the Blessed Oil as a sacramental is no different than the usage of blessed salt, palms, ashes, etc. Remember it is your faith, combined with Almighty God’s power and Will, in the Holy Name of JESUS, through the powerful intercession of the Archangel St. Raphael, all the prayers that go into the oil as it is being prepared, and the priestly blessing that heal you through this holy oil. It is good to remember that the holy oil is just a vehicle that God uses to heal us. We are all instruments of God, only God is the Divine Physician and healer. Some are healed instantly, some progressively, some spiritually, some physically, and some mentally. Some are healed in all three areas. You may be healed of something other than what you ask for. Whatever Almighty God’s Will is for you and your particular spiritual mission on this earth. ALL GLORY GOES TO ALMIGHTY GOD!